But you GUYS. 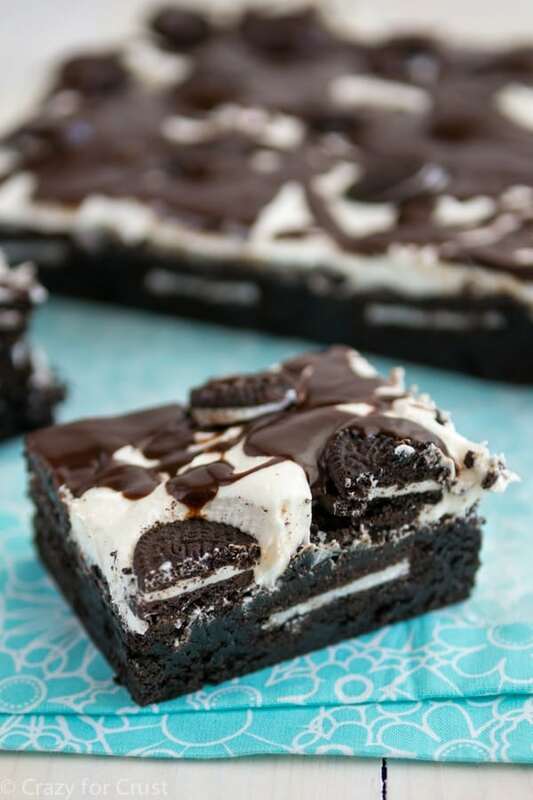 They’re not just Oreo Brownies. They’re unlike any brownies I’ve ever made before. Just LOOK at them! RIGHT??? See what I mean??? 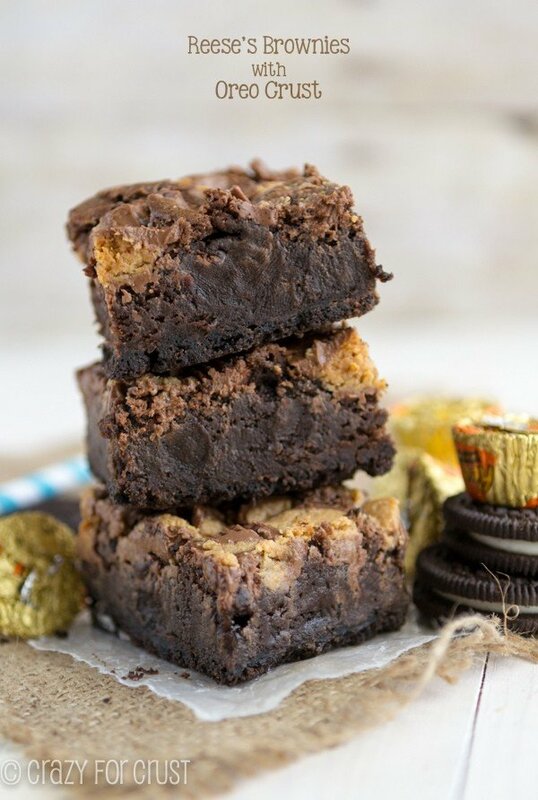 Back when I posted these Reese’s Brownies with Oreo Crust, I thought I’d outdone myself in the epic-holy-OMG-serious brownie business. But I was wrong. Oh, so wrong. 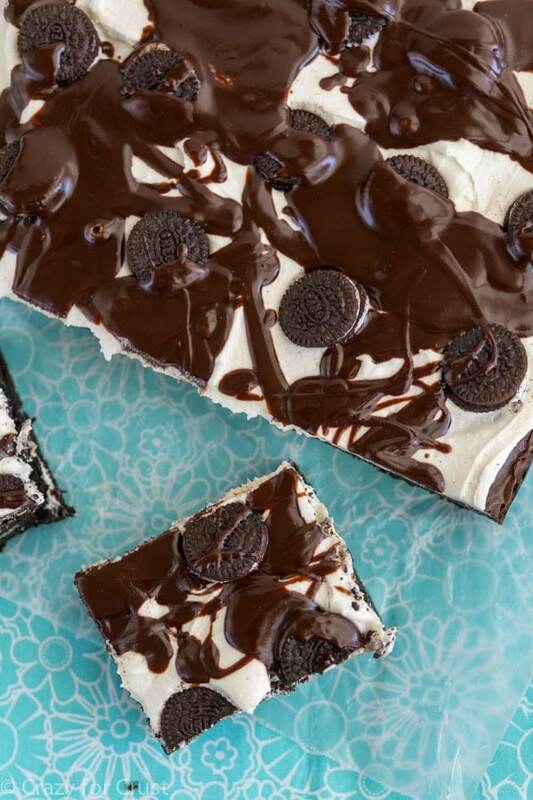 These Cookies ‘n Cream Brownies are extreme brownies, to the nth degree. 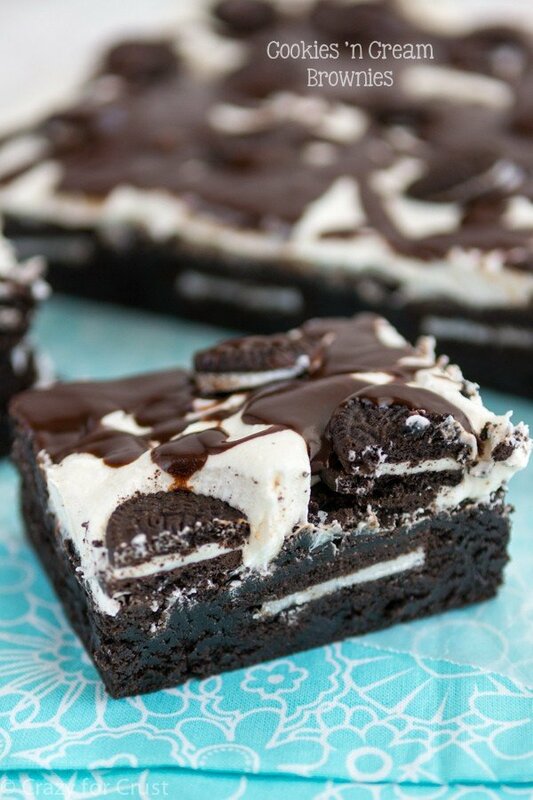 Fudgy, dark chocolate brownie, Oreos, fluffy white frosting, MORE Oreos, and chocolate sauce. Her entire book is full of brownie recipes and every single one has this brownie base that is a HUNK ‘O brownie. Like, seriously. Then you add dark chocolate and cocoa powder and sugar and vanilla. And THEN you add Oreos. I’m not kidding, the pan of baked brownies is heavy. You could use it to knock out an intruder. But that would be wasting brownies, so maybe use a bat for that instead. 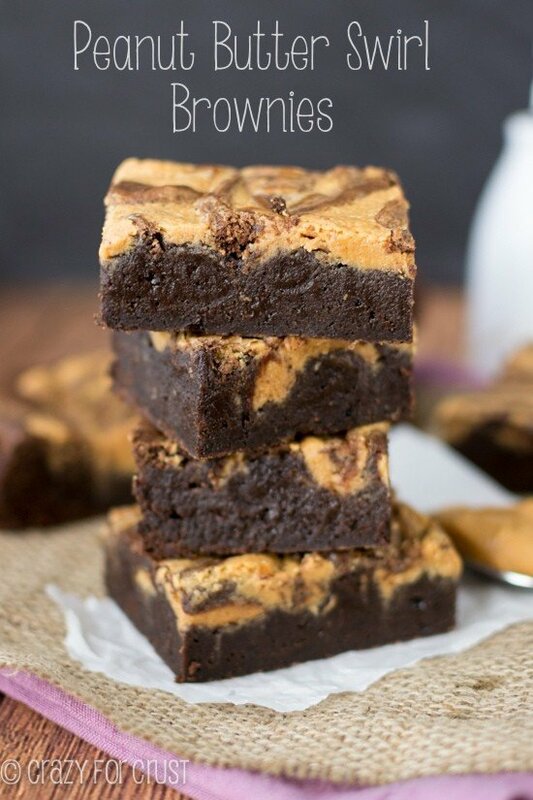 Seriously, have you looked at these brownies yet? So this recipe is a little more involved than my normal brownie recipes. There’s some sifting involved but that’s okay, it’s worth it. You have to let the brownies sit overnight, but you know that makes everything taste better (like cookie dough). Then you top them with a fluffy white frosting that tastes like Oreo filling. The secret to the filling? Marshmallow fluff. Who knew? Then, because there’s not enough Oreos inside the brownies, you top the frosting with more (mini) Oreos and a chocolate sauce. In her book, Connie calls for Dutch-process cocoa and 60% cacao chocolate. Now, because I bake a lot, I know where to get that stuff, but I don’t usually stock it. I adapted the recipe using what I (and most regular bakers) have on hand. I used Hershey’s Special Dark chocolate chips AND cocoa powder. You can also use regular cocoa powder (not the special dark), and I believe some of the other brands of chocolate chips have darker than semi-sweet flavors. Check your local store. Yes, you need cake flour. I’m sorry. I feel the same way about having to buy another flour. But if you forget, or need these rightthisminute before you can go shopping, did you know you can make your own cake flour? Because it’s September, the white chocolate covered Oreos are not in stores. Those are a seasonal product for the holidays, so if you see them, buy 2 boxes and use them instead of the regular Oreos. But regular work just fine…obviously. You could also try these with mint or peanut butter Oreos. Can you imagine?? These require a napkin and a fork. They can also serve as a meal. Holy cow. Did you LOOK at them? And I’m still dreaming about that frosting! I cannot wait to make that again really soon. Seriously – these are EPIC. Make them and then get them out of your house immediately. It’s what I had to do! 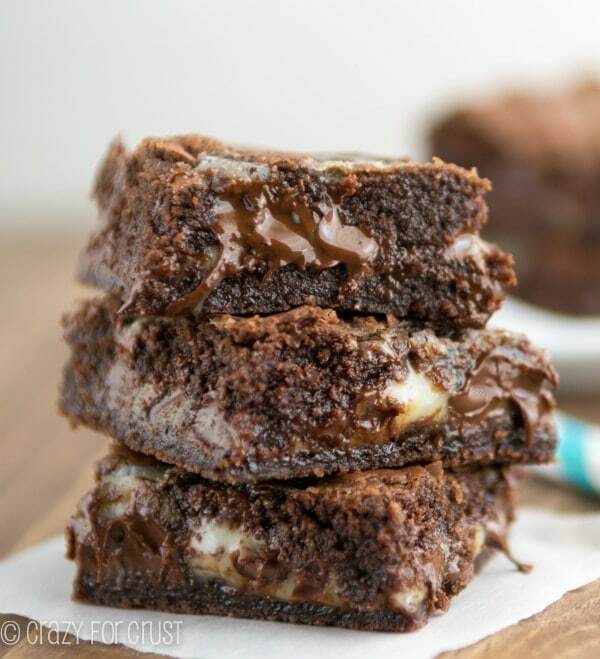 These brownies are extreme! 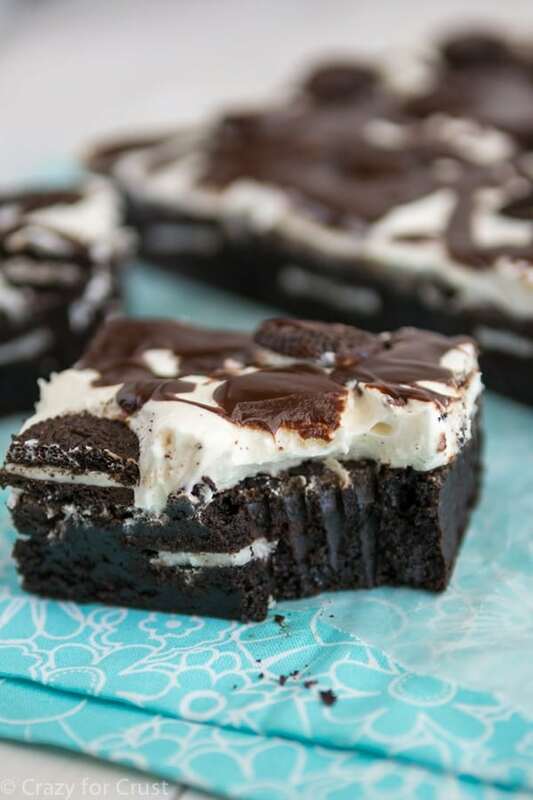 They're fudgy, dark, chocolatey, full of Oreos, and topped with a mouth-watering fluffy white frosting! Preheat oven to 350°F. Line a 9x13” pan with foil and grease with butter or spray with cooking spray. Cut the butter into 1-inch slices and place in a small saucepan. Melt over low heat and add the chocolate chips, stirring until the chocolate is melted and smooth. Turn off the burner but leave the pan on it (to stay warm). Whisk the eggs in a large bowl. Add the sugar and salt and whisk until incorporated. Gradually whisk the chocolate mixture into the egg mixture. Whisk in the vanilla. Place the flour and cocoa in sifter or a wire mesh strainer. Sift directly into the batter and stir with a spatula. Pour batter into prepared pan and spread until even. Place the 15 large Oreos evenly on top and press down lightly to cover with the batter. Bake for 28-34 minutes until a toothpick inserted in the center comes out clean. Cool to room temperature on the counter, then cover and let sit overnight (you can also refrigerate it overnight). Make the frosting: beat shortening and butter in a stand mixer with the paddle attached (or a hand mixer). Mix in marshmallow creme and vanilla. Slowly mix in powdered sugar. Spread frosting evenly over top of the brownies. Top evenly with mini Oreos. Make the topping: melt the butter and corn syrup in a small saucepan. Turn off the heat and stir in the chocolate chips, then stir in the water to thin. Drizzle over the top of the frosting. Chill the frosted brownies for at least 1 hour until the frosting and topping sets. Remove from pan and slice into bars.